This is a course on the alphabet of the Sanskrit language and it’s proper pronunciation. Students will learn how to read, write, and properly enunciate all the sounds of the sanskrit language. Sanskrit is a completely phonetic language and thus reading and writing will be taught simultaneously. The course material studied will be in both modern devanagari script (Sanskrit) and English transliteration with emphasis on the Sanskrit script. 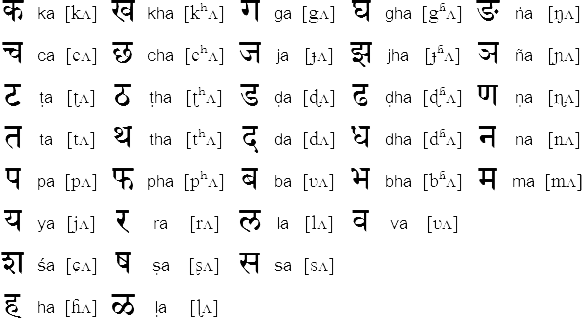 Proper pronunciation of all letters in Sanskrit alphabet. Confidently read basic words and sentences at a beginner level. Coherently write 60+ letters in devanagari script. Very basic grammar and syntax. 150+ basic terminologies as well as vocabulary words familiar to Ayurveda, Yoga, and Astrology. The course is designed for beginner students who have a sincere interest in learning; it will be taught according to the progress of the students. Students will be expected to study several hours per week outside of class. Students will need to make considerable effort in the beginning of their studies in order to create the proper foundation for further study. Only once students have mastered reading, writing, and pronunciation of the alphabet will they be able to confidently move forward. Course taught in English medium. All skill levels welcome. Age 16+. No small children. 30 hour course is divided into 10 weeks – once a week for 3 hours. Introduction to sanskrit language and brief history. -like nouns, each verb root takes different case endings.